Explanation: Few aurorae show this level of detail. This unusual display of an auroral corona occurred on Earth three days after an unusual solar event -- the fifth most powerful explosion yet recorded on the Sun. An X14-class solar flare on April 15 sent a tremendous Coronal Mass Ejection (CME) into the Solar System. This CME did not directly impact the Earth. 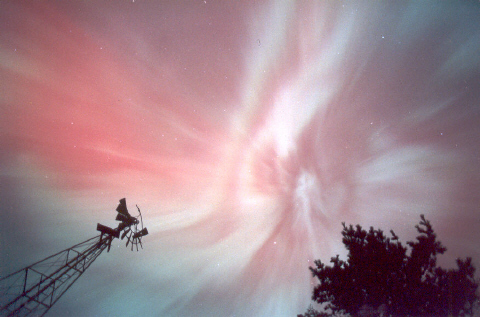 The Solar-System wide shock wave it created probably did, however, causing a G3-class geomagnetic storm and a night filled with colourful aurorae across much of northern North America. The unusual red colour of this Michigan aurora is caused by solar ions striking oxygen molecules 300 kilometres high in Earth's atmosphere. More typical green aurorae are caused by oxygen recombining only 100 kilometres high.